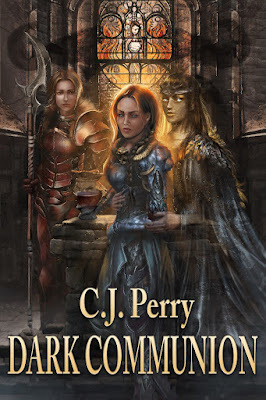 Goddess Fish Promotions has organized a Virtual Book Tour for DARK COMMUNION by CJ Perry, a epic fantasy available October 30. Today, I am featuring an interview with the author. “How far along are you?” They both knew what she really asked; are you carrying a calf? The woman met Ayla’s eyes and did not look away. Ayla’s heart ached with pity. Judging by the size of her womb, if she had carried a human child, she would only have two months to go. Horses clopped up the drawbridge until the other wagon stopped behind the first. The people on the back leaned to see what went on up ahead. 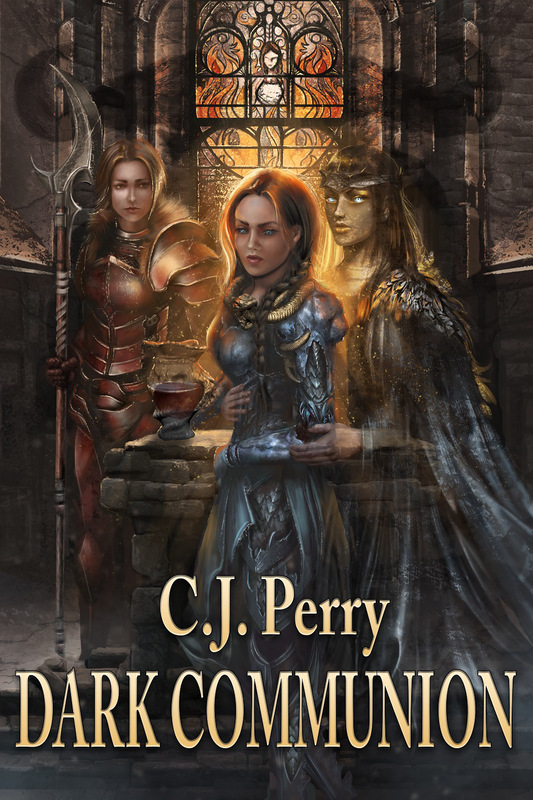 Ayla knelt down in front of the pregnant woman on the cool stone of the gatehouse. The woman bowed her head. “My brother, Gaelan, milady. Ayla shook her head at Butch with a stern look and he dipped his head in silent apology. She lifted the woman’s chin again. Her voice kept the compassion it had before, but with an edge. At its heart, Dark Communion is a love story of two girls who rise up and lead their people to freedom. That’s the kind of story I think anyone with an open mind can appreciate, especially Fantasy or Dark Fantasy fans. So far, it seems that Dark Communion is most popular with girls ages 14 – 35, and boys 18 – 30. I knew it was a story of a young girl who led a revolution with help from the Goddess of Darkness. I knew that I wanted one particular scene in the book; a literal Communion of a “Dark” religion just before the final battle. Naming the book was easy after that. I wrote the title of the book and started on chapter one. The title of the series was a little harder. I went back and forth between “The Shadowalker Chronicles” and “The Godswar Chronicles.” The Shadowalker is the name of the villain of the next series. This first series is her story. The next one will be the “hero’s” story. But in the end, I felt that over the course of the rest of the series, the conflict between light and darkness will be more important than any one character. I was lucky enough to find a brilliant young artist who is early in her career, Aleksandra Klepacka. I tried to work with Alex to represent the mood, themes, and important moments in the book. A good cover makes a promise to the reader. I wanted a promise, and for it to pose questions. The image features Ayla (front left), Deetra (back left) and the Night Goddess (front right) standing in the Hornstall Temple. Ayla has her hands on her belly, hinting at her pregnancy. She is solemn, and a bit sad but the Night Goddess holds her, comforting her. Deetra watches on from behind the altar, a look of concern on her face. Deetra is Ayla’s protector, best friend, and love. The stained glass in the background (which I love) is foreshadowing of later chapters. What a lot of people don’t notice at first glance is the shadow of horns over the temple. It is from a scene in chapter two, but is also symbolic of the looming threat of the minotaurs and Ayla’s fate. I would have to say the Dark Disciple Series by Margaret Weis. It’s not quite as dark as Dark Communion, and nor are the stories all that similar. The similarity is in the perspective. Not the literary perspective (1st person, 3rd person) but the fact that the protagonist is “evil.” In the Dark Disciple Series, Mina worships the Dark Queen Takhisis, but it doesn’t preclude her from being a good and moral person. Of course, her moral compass is a bit different from what most would consider “good.” In that regard, the Dark Disciple Series and Dark Communion are very similar. I posted a great meme about this on my facebook page. I thought it was prefect for this question. CJ Perry will be awarding a $10 and a $20 Amazon or Barnes and Noble GC to two randomly drawn winners via rafflecopter during the tour. It was my pleasure! Best of luck with your release, CJ.